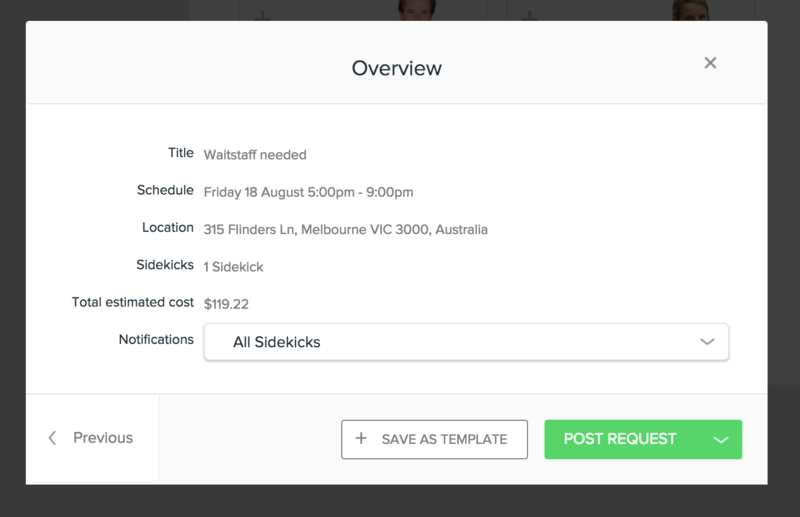 FIll in the ‘Request a Sidekick’ form - these details are what Sidekicks will see when they apply for the job! A clear and concise title and description will help you attract the best Sidekicks! The more details the better, so Sidekicks can make sure they are able to complete your request. You can also select any specific skills required for the job. This will show up on the job post and you will be able to see which of your applicants possess these specific skills. This is the information Sidekicks will see about how to contact you, and where the job will take place. The job location is where your Sidekick will need to be to complete the job. It’s best to make sure this is accurate so that Sidekicks only apply to jobs they are able to get to. If your job is outside of metropolitan areas consider increasing the hourly rate or offering a travel bonus in the job description. The contact details you provide here are what the Sidekick will use to get in contact with you. Your contact details will only be released to the Sidekicks you hire for the job. You can include a mobile number or email address. What is the schedule and hourly rate? Here you will be able to set the date, time, and hourly rate of the job. The minimum you can post a job for on our platform is at the award rate for the category the job is posted under. You will be able to review the key details of the job before clicking 'Post Request' and notifying our sidekicks of your job. If you need to make any changes, you can click 'Previous' to change any additional details. After clicking ‘Post Request’ your job will be live to all our qualified Sidekicks! You will begin to receive applications for the job. We find over 90% of jobs posted on the platform are filled within 1 hour! For help hiring Sidekicks and completing your job, have a look in our Help Centre for more information!